I Learned To Break 80 -- You Can Too! Can't understand why you're not improving? 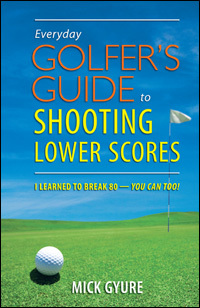 Everyday Golfer's Guide to Shooting Lower Scores book is written by someone who has been there and understands the challenges facing golfers who are struggling with their game. Mick Gyure was an average guy who started playing golf in his mid-thirties and ultimately, he found a number of things that allowed him to achieve his goals quickly—specifically, breaking 80! Let this book show you how to make true improvements in your game, and how to overcome common barriers to getting lasting results. Positive Light is a trademark of PL Motivations, Inc. Copyright © 1997-2009, PL Motivations, Inc. All Rights Reserved.